Chicago's Mayor Daley has endorsed legislation to mandate that licensed Chicago businesses open more than 12 hours per day install both indoor and outdoor surveillance cameras. This, Mayor Daley believes, will lead to a reduction in crime and will help police solve crimes that occur. He said, ""Block clubs, community organizations want cameras. ... They can't walk down the street. ... Their kids have to go around a corner away from the gang-bangers. You can't walk to church. You can't get on the CTA. ... Cameras really prevent much crime. Cameras also solve a lot of crime. The terrorist attacks in London were solved by cameras. The whole incident was solved by cameras," according to the Chicago Sun-Times. Mayor Daley is correct in saying that installation of surveillance systems serves as both a deterrent to crime and a tool in solving crimes. However, Mayor Daley is still wrong to propose legislation mandating that businesses open over 12 hours per day install cameras. Just how many cameras are we talking about? According to Chicagoland Chamber of Commerce President Jerry Roper, 12,000 businesses are open in Chicago for more than 12 hours per day, many of them restaurants and hotels. "Some places will take a look at the cost and say, 'We'll only be open for one shift or a shift and a half. They'll take a look at their last two hours and say, 'I'm not making that much anyway. I'll just close earlier.' Employees will lose that money," Roper said. According to the article in the Chicago Sun-Times, "[l]ast week, business leaders lined up in opposition to the mandate on grounds it could add anywhere from $5,000 to $20,000 to their costs -- even before monitoring expenses." Apparently, businesses are not buying into the idea that installing cameras will be a smart move. Perhaps they do not perceive as high a crime risk as elected officials do. Had the business owners thought that the risk of being robbed was sufficiently high, and the cost of being robbed was also high, they would have already taken precautions such as installing cameras. Instead, businesses often take less costly precautions. They may keep less cash on hand, store valuables in safes, have alarm systems for after hours, etc. For cost effective solutions to crime, I'd trust the business owners themselves over Chicago's Mayor Daley. If you can't beat 'em, sue 'em! At least that seems to be Saddam Hussein's strategy now. The former Iraq dictator is bringing a lawsuit against President George W. Bush and Prime Minister Tony Blair for, of all things, using weapons of mass destruction in the commission of war crimes. Hussein's lawyers say that they plan to sue in the International Criminal Court in the Hague. According to the Washington Times, Bush and Blair have been accused of "destroying Iraq" and "committing war crimes by using weapons of mass destruction and internationally-banned weapons including enriched uranium and phosphoric and cluster bombs against unarmed Iraqi civilians, notably in Baghdad, Fallujah, Ramadi, al-Kaem and Anbar ... The suit also accuses the U.S. president and British prime minister of torturing Iraqi prisoners, destroying Iraq's cultural heritage with the aim of eliminating an ancient civilization, and inciting internal strife. " Last, but not least, we find that Hussein is not only a concerned Iraqi, but an environmentalist, also accusing Bush and Blair "of polluting Iraq's air, waters and environment." Perhaps there is some truth to the hypothesis Walter Williams put forth in his August 31, 2005 article, "What's a way for OPEC to gain more power? I have a hypothesis, for which I have no evidence, but it ought to be tested. If I were an OPEC big cheese, I'd easily conclude that I could restrict output and charge higher oil prices if somehow U.S. oil drilling were restricted. I'd see U.S. environmental groups as allies, and I would make "charitable" contributions to assist their efforts to reduce U.S. output." According to a Yahoo news source, "Saddam also wants all Iraqis who have had relatives killed or had property damaged [to] receive at least $500,000 each." With his newly discovered strategy, perhaps Hussein still has a career in politics. Five hundred thousand dollars, especially in Iraq, is a much better deal than "middle-class tax cuts." Lawyers for a small-town parish priest have been ordered to appear in court next week after the Roman Catholic cleric was accused of unlawfully asserting what many people take for granted: that Jesus Christ existed. The Rev. Enrico Righi was named in a 2002 complaint filed by Luigi Cascioli after Righi wrote in a parish bulletin that Jesus did indeed exist, and that he was born of a couple named Mary and Joseph in Bethlehem and lived in Nazareth. Cascioli, a lifelong atheist, claims that Righi violated two Italian laws by making the assertion: so-called "abuse of popular belief" in which someone fraudulently deceives people; and "impersonation" in which someone gains by attributing a false name to someone. Cascioli says that for 2,000 years the Roman Catholic Church has been deceiving people by furthering the fable that Christ existed, and says the church has been gaining financially by "impersonating" as Christ someone by the name of John of Gamala, the son of Judas from Gamala. Here's a question: if a complaint such as this one were filed in the United States, would any court ruling inherently violate the principle of separation of church and state? Would the state's ruling serve to respect one religion over another or prohibit the free exercise thereof? If the complaint took place in the United States, one would certainly ask how a lifelong atheist would have standing; as a lifelong atheist, who has himself claimed to be "born against Christ and God," it is not likely that he has personally been a victim of fraud by the Roman Catholic Church. In the United States, the question of whether the Christ exists is not one for government to answer. On the agenda tomorrow for the District of Columbia Council is a public hearing to "assist the Council in selecting a fruit to be designated by an act of the Council as the official fruit of the District of Columbia." Luckily, sixth grade students at Bowen Elementary do not have math, literature or science to study. Instead, they are researching fruits that might be appropriate as the official fruit of Washington, D.C. The story was introduced in November of 2005, when Council Chairman Linda Cropp introduced a resolution asking the elementary school students to find a suitable fruit based on its "abundance in the jurisdiction, its popularity in the jurisdiction, or for its symbolic meaning." We might conclude that the Council has nothing better to do with its time. Au contraire - in November of last year, Council Members undertook many other tasks with taxpayers' money, including establishing the "Office of Gay, Lesbian, Bisexual and Transgender Affairs within the Executive Office of the Mayor," and establishing "standards for responsible business practices by large retailers by ensuring that they pay living wages, provide benefits, and respect free speech" through the Large Retailer Accountability Act of 2005, along with the usual tasks of making sure that you cannot park in the front lawn on private property and must use a hands-free device while driving and talking on your cell phone. Of course, the Council Members only want to teach youngsters about the political process, as it states in the resolution: "That having school children propose an official fruit to the Council through proposed legislation will teach the children about the political process and the importance of public participation in civic life and show all our residents that all people, young and old, can get involved in politics and in their own government." After all, children should understand at a young age that all one has to do to impose his will on others is appeal to politicians to enact a law. I say we all pitch in and get them the large print version. Regardless of what Samuel Alito's opinion may or may not be on abortion, democrats are grasping at straws with Alito's supposed attempts to undermine Roe v. Wade. In particular, they cite Alito's dissent in a 1992 case in Pennsylvania, Planned Parenthood of Southeastern Pennsylvania v. Casey. At that time, Pennsylvania had a law which required that a married woman seeking an abortion notify her husband first. Note that the law clearly did not require the consent of the husband -- only notification. The law also made exceptions for women who believed that telling their husbands could threaten their safety. It hardly amounted to a threat to Roe v. Wade and did nothing to limit a woman's ability to obtain an abortion. No one on the pro-life side would have seen the law as a victory in even the most minute sense of the word. However, former head of the NARAL Pro-Choice America, Kate Michelman, was quoted saying, "What we need to get at here is how Judge Alito could have believed that forcing women to notify their husbands before having an abortion was not an undue burden on women. That opinion treated women like little girls." Rather than restricting the ability of a woman to abort her child, the law merely required the married woman to behave as though she was, well ... married. To ask the government to legally recognize a marriage between a specific man and woman is to ask that the man and woman be treated as a unit. Assuming that marriage is voluntary, the man and woman have both agreed to this union and the accompanying treatment under the law. There's a very simple way to avoid the responsibilities that come with marriage: don't get married. If voting to uphold the Pennsylvania law constitutes an attempt to overturn Roe v. Wade, perhaps we should be concerned that upholding the Kelo v. New London decision constitutes an attack on a woman's right to property. Perhaps we should be more concerned that a woman's right to keep and bear arms is under attack by more than just laws requiring the woman to inform her husband of her gun collection stored in the basement (unless, of course, telling him could threaten her safety). Perhaps we should question whether a woman truly has the right to her own body, when she must not only notify but receive the consent of a doctor to obtain medicine or when the FDA decides what she is permitted to use to treat pain and illness. 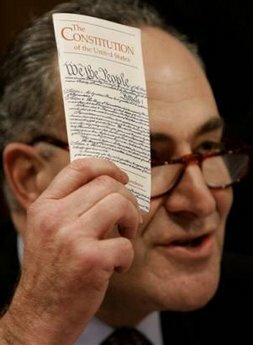 If violating Constitutional rights is no longer in vogue, someone needs to inform the politicians in the confirmation hearings. Before they point the finger at Alito, a good look in the mirror might just be in order. The pervasive myth that the Civil War (the War Between the States or the War of Northern Aggression) was fought over slavery bypasses any reasonable debate over the merits of a decentralized government and 'states' rights' from a overly powerful federal government. Instead, history books proclaim Lincoln as the "Great Emancipator," conveniently ignoring that the Emancipation Proclamation was purely a tactical move to win the war and only applied to states that would not renounce their intentions to secede. Read Denson's article. It provides a historical account that you are not likely to find in your average history book. The news has been providing continuous updates on Ariel Sharon, prime minister of Israel, who suffered a massive stroke. Many have expressed concerns over potential consequences of Sharon's death or inability to resume the position of prime minister. One article references a reason why Israelis may be concerned, noting that: "Israelis from all walks of life have lamented Sharon's likely departure from the political scene because, with his larger-than life persona and warrior credentials, Sharon was widely seen as the man most capable of untangling the Israeli-Palestinian conflict." Generally speaking, Americans are less concerned about the health of the president or other high ranking elected officials. We feel that we can worry less about who might take the place of a leader, because to some extent we trust the measures in place to check the power of our leaders. This is not the case in many other countries. Many countries have relied heavily on their leaders to maintain stability, order, and peace. In doing so, they have sacrificed the autonomy that limited government provides. By allowing their leaders such a pivotal role, they have put all of the proverbial eggs in one basket. In the event that the leader is no longer able to rule, the people are left to wonder what will become of them. Who will provide them with stability? Who will make laws? Who will tell them the proper way to tie their shoes or which end of the egg to break? Truly we can draw a valuable lesson from observing others worry over the fate of their leaders. Knowing that we can capably lead ourselves and ensuring that our leaders do not have the ability to destroy the work of others will allow us to worry less about who is in power, but rather worry about how much power we allow our leaders to have. It was sad to hear of the mining accident that occurred at the beginning of this week, in which twelve miners were killed after an explosion in a West Virginia mine. In typical reactionary fashion, many people have suggested establishing stricter safety regulations for mines. Naturally, they hope that more stringent requirements will result in fewer deaths and injuries. BBC News notes that while the U.S. has significantly fewer mining deaths than China (30/year in the U.S. compared to China with 8,000/year), the current requirements of "at least four mandatory inspections by the Mine Safety and Health Administration each year" and penalties ranging up to $60,000 per safety violation may not be enough. Claudia Cole, widow of a Kentucky coal miner who was killed last year when the roof collapsed on a mine in Harlan County, Kentucky, hopes that the tragedy will help prevent other deaths from occurring. "'[The miners are] safer than they were back in the 1930's,' Cole explains. 'But to me they're not doing everything they could. If they were, there wouldn't be these deaths.'" According to the article, Cole would like to see more safety rules come from the recent mining accident. An NPR interview cites "[t]ougher government regulation and technology improvements" as the reason why mining accidents have decreased over the past two decades. Davitt McAteer, former assistant secretary for mine safety and health at the Department of Labor, says, "Trouble is, no matter how many safety measures we introduce into the workplace, the dangers are recreated every 24 hours ... Miners have to be a lot more vigilant than other workers." Miners understand quite well that their job is a dangerous one. They do not take these risks blindly. For their level of education, they are highly compensated due to the risky nature of the profession. If the workers truly wanted a safer job, they would settle for one that requires the same level of skill and would inevitably pay less. As much as I dislike hearing stories of miners killed in accidents, the risk level that the miners take is not mine to decide. The amount of additional compensation for risk is not mine to take away. Safety isn't free. We all take risks, and I would venture to say that we all take risks with our own lives if we feel the benefit exceeds the risk of an undesirable outcome. I drive a convertible sportscar. It's not the safest car in the world, but I knowingly take the risk of driving a car that would not survive a major accident. Members of my family would prefer that I drive a safer car and sacrifice the enjoyment I derive from my current vehicle. Luckily, they have not yet appealed to the government to impose safety regulations that my car would not pass. Just as miners exercise greater caution while they are at work in the mines, I exercise greater caution while driving as another way to counter the risk that my surroundings impose. Regardless of how insignificant my personal example is, the principle applies equally to other risky scenarios. As we enter 2006, let's not start out with additional regulations, but leave important decisions to those whom they will affect. A reader asked me an excellent question last week: What is the proper separation between private businesses and government? It is true that businesses often influence government by lobbying for legislation in their favor. Why is government influenced at all by businesses? The answer is simple - because government has the power to grant them favors that will amount to millions of dollars. Complaints of the intermingling of government and private companies come from both the right and left. Democrats complain of Republican administrations awarding contracts to private companies without requiring companies to bid on them (Halliburton & the George W. Bush administration), and Republicans complain of Democratic administrations allowing dishonest executives to spend the night in the White House and giving them huge subsidies (Enron's Kenneth Lay & the Clinton administration). Both complaints miss the point. The problem is not with one administration or another (although one does not have to look far to find them). Instead, the problem is that government has gained the unconstitutional ability to pass laws that benefit some at the expense of others. I may have directed readers to Bastiat's work previously, but it is worth rereading. 'The Law' describes what Bastiat terms "legal plunder" and suggests, "the proper purpose of law is to use the power of its collective force to stop this fatal tendency to plunder instead of to work. All the measures of the law should protect property and punish plunder. But, generally, the law is made by one man or one class of men. And since law cannot operate without the sanction and support of a dominating force, this force must be entrusted to those who make the laws. This fact, combined with the fatal tendency that exists in the heart of man to satisfy his wants with the least possible effort, explains the almost universal perversion of the law. Thus it is easy to understand how law, instead of checking injustice, becomes the invincible weapon of injustice. It is easy to understand why the law is used by the legislator to destroy in varying degrees among the rest of the people, their personal independence by slavery, their liberty by oppression, and their property by plunder. This is done for the benefit of the person who makes the law, and in proportion to the power that he holds ... God has given to men all that is necessary for them to accomplish their destinies. He has provided a social form as well as a human form. And these social organs of persons are so constituted that they will develop themselves harmoniously in the clean air of liberty. Away, then, with quacks and organizers! Away with their rings, chains, hooks, and pincers! Away with their artificial systems! Away with the whims of governmental administrators, their socialized projects, their centralization, their tariffs, their government schools, their state religions, their free credit, their bank monopolies, their regulations, their restrictions, their equalization by taxation, and their pious moralizations! And now that the legislators and do-gooders have so futilely inflicted so many systems upon society, may they finally end where they should have begun: May they reject all systems, and try liberty; for liberty is an acknowledgment of faith in God and His works."